Surely, the fairy tale couldn’t last forever? Surely, the folklore going around that Carson Wentz could 1) Save the country’s burgeoning debt crisis, 2) Cure every form of cancer, 3) Be the perfect husband for your sister/daughter AND 4) Never throw an interception could not all be true? The last theory was debunked last Sunday in Motown when Wentz, with enough time to lead his team down the field for a winning field goal, threw an ill-advised pass downfield to Nelson Agholor who, when in tight coverage with a defender for a pass, looks more like he’s doing the “limbo dance” than actually fighting for the ball. As the Lions celebrated and their fans, who seemed comatose and disinterested for most of the game, actually came to life, Wentz walked off the field presumably humming the Human League’s 1986 hit song “Human” playing in his head (cause frankly, he’s only human…of flesh and blood he’s made). The throw was young Carson’s first interception of the year and negated what had been an Eagles comeback from two scores down in the 2nd half to take the lead, before Ryan Mathews fumble on 3rd &2 eventually led to Detroit kicking what was the eventual winning field goal. No one expected the Birds to go 16-0, and it’s not necessarily a surprise that they lost a close game to the Lions. But it was more HOW they lost it that hurt the most. If the Eagles were not coming off a bye, the Lions contest could have easily been labeled a “trap” game, considering that they were coming off a big win against the Steelers and facing a division foe in the Redskins this week. But I thought the bye would work to negate any kind of letdown against a Lions team that has not won anything of significance since the 1950’s. I was wrong. Perhaps this kind of wakeup call is exactly what the Birds needed. 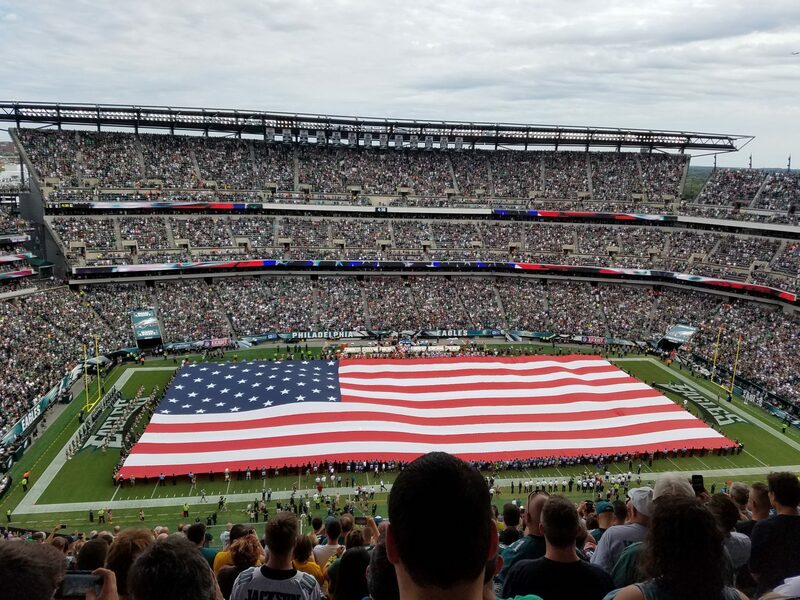 The expectations for this season have changed significantly after four games, and a 8-8 season will no longer be considered a success as it was before the Eagles took the field against the Cleveland Browns on opening day. The Birds face a tough test on the road this week. The Redskins have rebounded from an 0-2 start to win three straight and are in the thick of the NFC East race at 3-2. Don’t look now, but the NFC “Least” is currently the best division in football, with three of the four teams (Cowboys, Eagles, Redskins) with winning records, and the Giants not far behind at 2-3. The Eagles would do well to run the ball against the ‘Skins, who possess the league’s 30th ranked run defense. Last week, both Wendell Smallwood & Kenjon Barner looked like they had been placed in the witness protection program by coach Doug Pederson, as both seemed to be conspicuously absent from the running game. Mixing in both Smallwood & Barner into the running back rotation would help to keep Darron Sproles & Ryan Mathews fresh as well, especially as the game wears on. Any division game the Eagles play always seems to be a tough game no matter the record of either team. But I don’t think the Redskins are as good as their 3-2 record suggests. And coming off a tough loss to the Lions, the Eagles will not take Washington lightly. Birds win 27-17 and the “ying and yang” is in balance once again in “Eagleville”. This entry was posted in Eagles, football, NFL, Sports, Uncategorized and tagged carson wentz, football, NFL, Philadelphia Eagles, Washington Redskins. Bookmark the permalink.